Climate - Extremes - Rainy Season - Snow? The South Africa Weather is something most people can only dream about: Abundant sunshine and deep blue skies for most days of the year. South Africa is a great place to travel all year round. To make most of your holiday experience, it is advised however to check the weather facts before you go. If you pack the right clothes for the right weather, you will enjoy your trip, whether hot or cold temperatures are predominant in the season! However, as the country lies in different climatic zones, thus the weather conditions in the seasons vary according to the regions and the layout of the land. See the climatic regions on the map below. In the high veld region which is the high plateau in the centre, north and west of the country, the winters are usually dry with cold nights, where as the winters along the coast are usually humid with plenty of rain especially at the Western Cape. The summers will get very hot in the desert region and hot and humid in the north eastern and eastern parts of the country where a subtropical climate prevails. The rainy season in most of the regions in South Africa is in summer. 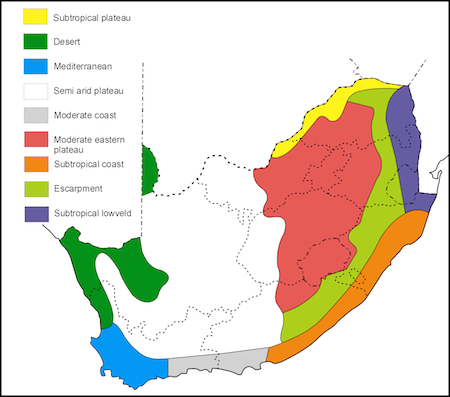 The Western Cape however is a winter-rainfall area. 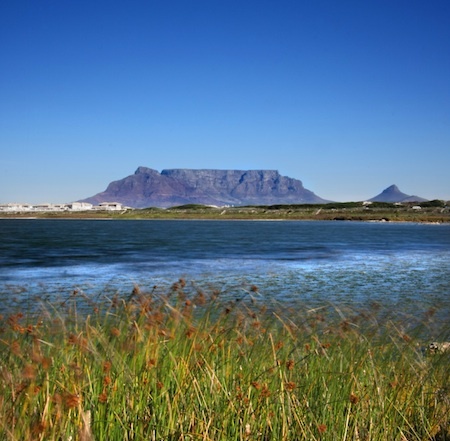 Read more about the Cape Town seasons here. The temperatures range in South Africa from mild to hot in summer, the rainy season is mainly during summer with the exception of the Cape region and in general, the South African climate invites to a great outdoors lifestyle. Here some average temperatures at a glance. High temperatures are recorded in summer in many regions, however, record-breaking highs are measured predominantly in the arid regions of Limpopo and the Northern Cape. On the other hand, low temperatures and even snow are not rare occurrences in winter in the higher lying areas in the centre of the country. Especially be prepared for icy cold nights on the high veld. Did you know, that you even can go skiing in some of the higher lying areas of the Drakensberg mountain range? The sun shines in South Africa more days in the year than in many countries around the world and the average rainfall is much lower in South Africa too. More on the temperatures and what to pack for Johannesburg, Cape Town and Durban here. South Africa Weather: Windy conditions? Along the South African coastline, you can experience an especially mild South Africa weather with quite a lot of wind. Cape Town and Port Elizabeth are known as the windy cities! Windsurfers appreciate the constant breeze along the Cape coasts and Jeffreys Bay in the Eastern Cape as well as Langebaan Lagoon on the West Coast are referred to as 'surfers' mecca' by the surfing community. Cape Point which lies on the Cape peninsula south of Cape Town, is the windiest place in South Africa and you have to keep this in mind when planning a trip to the southernmost point of the Cape peninsula. The southernmost point in Africa, Cape Agulhas, a three hours drive east of Cape Town, is equally breezy most of the year! Also trips up Table Mountain with the cable car is not always possible when there are strong winds. Check for opening times and Table Mountain webcam here. Here are our favourite getaways for the seasons. But as mentioned above, South Africa is great in every season, just know which weather to expect and you will enjoy your stay in South Africa any time of the year! Summer: Especially all coastal Regions along the Western and Eastern Cape are great for the stunning beaches. The inland regions can become very hot. The 'Gardenroute' between Cape Town and Plettenberg Bay can become quite busy, so book early, especially during school holidays! Autumn: Cape Winelands, KwaZulu Natal and the northern and eastern parts of the country after the summer rain. Diving along the north eastern coastline. Winter: KwaZulu Natal coast and Durban. 'Whale watching season' along the Western Cape coast. Actually the South Africa weather in winter is great for any city break. Also the northern and eastern parts of the country now are stunning with blue skies during the day due to their dry weather conditions in winter. But be prepared for cold nights! africaweather is very comprehensive and this site has various pages and functions informing about storms and giving pretty accurate warnings, a very good 'activities' page telling you to better 'get out there' or to 'better stay at home';) . It also has a variety of maps and graphs to support their forecasts. weathersa is recommended for its variety of forecasts. The official website of the South African Weather Service gives you the information also the local broadcasters rely upon. Besides pretty reliable forecasting, there is advise on the best activities for the weather conditions similar to the africaweather site, where you will find out which sports can be enjoyed best with the prevailing weather conditions or which activities might be better avoided or postponed on that day. wavescape is enjoyed by many for its more fun approach to describing the weather and ocean conditions. The site has a really good surf and ocean watch to give you the best forecasts for conditions along the South African coastlines. The site tells you the sea temperature, list ocean swell, wind force and tides as well.